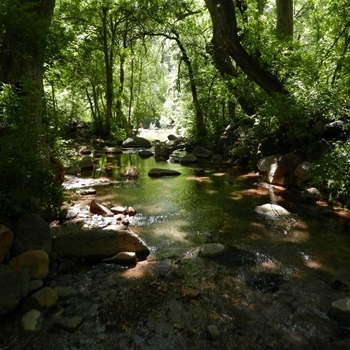 A "must" for any hiker; this trail takes your from the Rim Country mesas down into a Riparian, spring area! Features and Interests: Millions of gallons of water flow from the springs every hour (water at cool 72 degrees) creating a riparian environment giving life to lush vegetation and plant life. Trail Description The trail starts out quite flat, initially following an old jeep road. Within the first mile, it will take a right, starting to descend quickly and steadily on a dusty rocky trail. The trail is very open all the way down so make sure to wear sunscreen lotion and hat! Enjoying the panoramic views, in about 3 miles you will near the bottom. When you come to a junction with the Mail Trail, keep left on the Fossil Spring Trail. A short distance from here, you will reach a streambed/wash and you will follow the single trail to the west approximately .3 miles to the spring. The spring is in a lush area, so you will want to explore the trail further down which lead to amazing waterfalls and bathing pools! Accomodations: (on site) Toilets Camping Directions: Drive north 18 miles from Payson on Highway 87. In Strawberry, turn left on Fossil Creek Road (FR 708) just passing/next to the Strawberry Lodge. Go 3.8 miles west on FR 708 (first 2 miles are paved and rest are dirt). Near 3.8 miles, turn right onto a side road (turn off was not marked, look for cars/parking lot off to the right) and follow 1/4 mile to the trailhead parking lot. Accessibility: Good dirt road, off-road vehicle not needed.